Everyone wants a longer happy hour, right? Especially beer brands that make all that beer you're going to drink if you stay in the bar longer. So it makes perfect sense that a brand like Carlsberg would do whatever they can to get people to stay in bars longer and drink more beer. The Denmark-based campaign urges people to upload photos to Instagram from their location, mention the bar name and tag the photo with #HappyBeerTime. The images then appear on TVs in the bar. A special Chromecast-like HDMI stick that plugs into the TVs of participating bars makes the whole thing work. Of the effort, Carlsberg Digital Group VP Jens Jermin said, "Our innovation strategy is anchored around mixing creativity with technology to foster the new breed of consumer experiences for the advantage of our business. That's why it was only natural for us to update the beloved concept of Happy Hour, with a new type of post-social media consumer in mind. This led us to ask Konstellation to come up with a solution that added to, rather than distracted from, a night out. 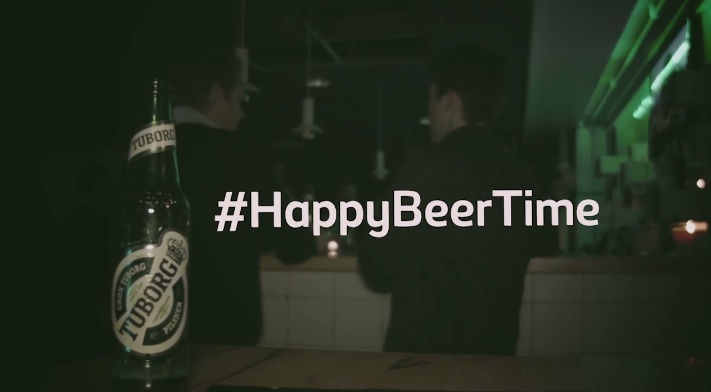 And in our humble opinion, that is exactly what we've managed with #HappyBeerTime." Thomas Pries, founding partner and CCO of Konstellation, the agency which created the campaign added, "At Konstellation we always seek to create new digital playgrounds for our clients' customers by tapping into people's existing behaviors. #HappyBeerTime is a good example of our approach to innovation, as people already instagram their way through their nights out. Our additions to this existing behavior are simple: an HDMI stick and hashtags. Bar-owners plug in the HDMI stick, and bar-goers use specific hashtags that, when added to their Instagram photos, result in instant rewards - prolonged Happy Hour, and of course, more beer sales."